We are all somewhat used to one technology firm suing another for patent infringement but they tend to be treated as isolated instances. (see NY Times). However when you look at the bigger picture as Tech Crunch has done below, you have to wonder how anyone can produce a new phone, let alone a ‘smart’ one. 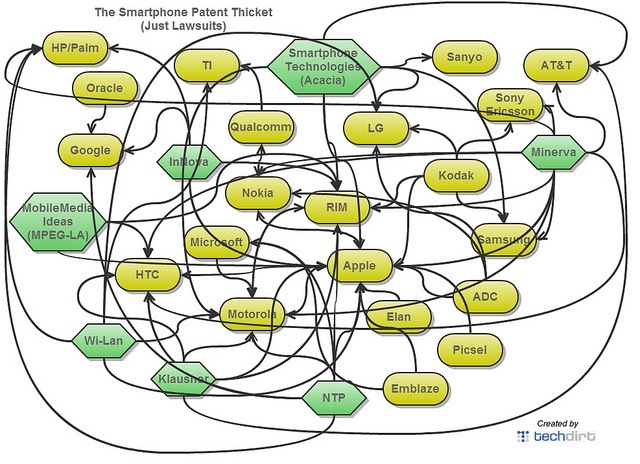 I sort of remember back when Ericsson, Nokia, Qualcomm and Motorola ruled the smartphone market (2G days) that patent licensing could make up to 30% of the cost (worst case) although 5% was more typical and because of cross-licensing much less than that amongst the big 4. With the mess above – “patent thicket” sums it up beautifully , the barriers to entry and innovation are becoming inordinately high. Of course, as innovation stalls, there will be a silver lining as everyone keeps their phone for longer and the number of phones in landfills is reduced. 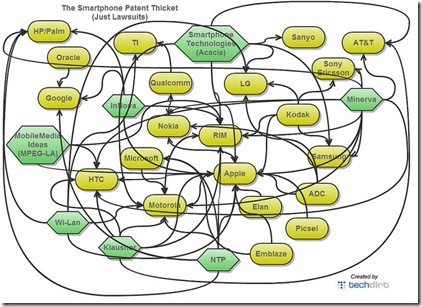 This entry was posted in Business Model, Consumer Electronics, mobile phones, Telecom and tagged licensing, patent, patent thicket, smartphones by geoff. Bookmark the permalink.